If you’re anything like myself, scrunchies have completely taken over your life and you currently have a collection of 15+ that now have their own drawer. Lol. What the heck is it about scrunchies that can make your hairstyle feel so comfy but also like a little style element?!! With summer right around the corner, I can’t help but prep myself for all the scrunchie styles I’ll be whipping out for most occasions, beach days, walking my horse, wine nights, and most importantly, on Sunday’s where I don’t leave the couch. Here are 5 of my favourite styles that I am super excited to share with you! This low pony is probably my most comfiest style, as is takes about 2 seconds to achieve. I love this style because you can easily style it with an over sized crew neck & sweats, to a cute summer dress with a pair of mules. You want to start off with adding loose waves to your hair, (if you have natural beach wave hair, then I rly envy you and skip this step) a good wand curler will do just fine! The secret to a loose natural wave style is loosely curl a piece of your hair and then brushing the curl out! When your hair is completed and full of all the prettiest waves, grab your favourite scrunchy and pull your hair into a low pony! I like to leave out some side pieces so it’s still a little undone. I like to start out my separating my hair into 2 sections. 1 - being the section I leave down, and 2- being the section that I use for my top knot bun. To start off, I’ll throw in some loose curls throughout the section I will be leaving down while using my curl wand, these don’t need to be perfect curls but you want to make sure each piece is curled. I will then take the top knot section and throw that into a tight/messy(if that makes sense lol) bun using whatever scrunchie I’m in the mood for!! This hairstyle speaks for itself when it comes to the instructions. Starting with a pre-curled/wavy hair style(straight will be fine as well!) you basically want to pull your hair in the highest ponytail that you can while using a brush to keep it neat! I like to use a hair tie to secure the pony tail before I put my scrunchie in to prevent it from falling loose/out. Finally, go grab your favourite scrunchy and add to your ponytail for the finished look. I cannot wait to wear this style for the summer! 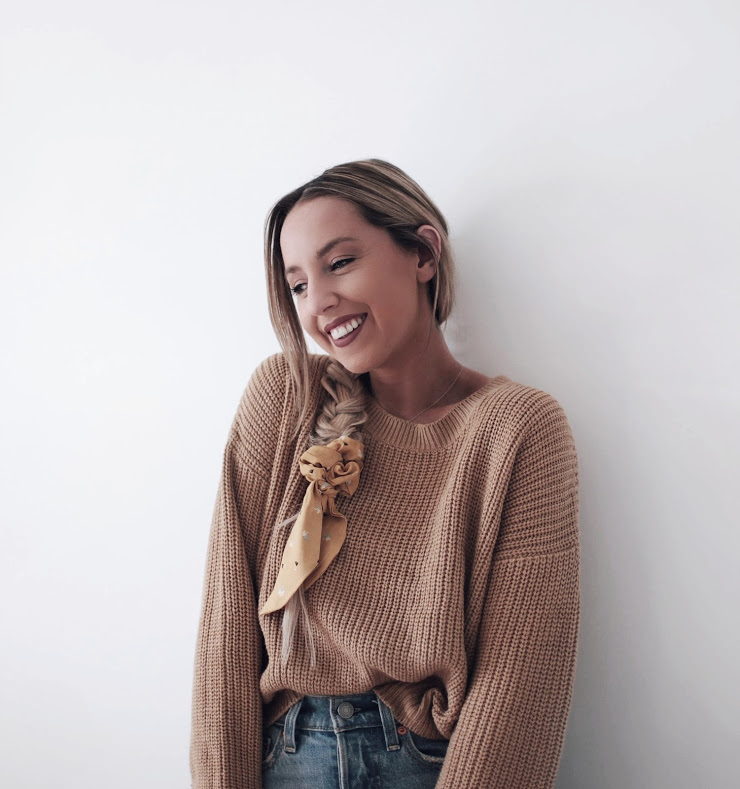 I love this look mostly because it involves a braid, and you all now how braid obsessed I am loll, but also because it is such a classic and effortless summer look, adding the scrunchie to this is the perfect accessory to tie it all together! For this look, you can basically start out with any style hair you like - straight, wavy, loose curls, whatever you feel will work best for a side braid! I like to brush out my hair first so that any knots or tangles will be free from the braid itself. You then will pull all your hair to whichever side you desire and you can begin your braid. The braid doesn't have to be overly tight as you want it to look a little looser and effortless. Once you’ve completed the side braid, you will then secure the bottom of the braid with whichever scrunchy you chose for this style. I always hold the bottom of my braid when it’s done, and pull pieces loose so it’s thicker and more undone. The final scrunchy look I wanted to share with you guys is such a fun style! How cute is the dutch braid?!! This style is such a great way to dress up your casual messy bun! It’s also awesome for if you have shorter pieces in the back that don’t fit into your high ponytail or bun. I start with separating my hair into two sections - a top half section and bottom half section. I will then flip my head upside down and begin my reverse french dutch braid. This may be a little tricky at first as you’re going against gravity lol, but after a couple tries you should have it mastered! Once you have the french dutch braid completed, you’ll want to add it with the top section of your hair and pull everything into a messy bun! 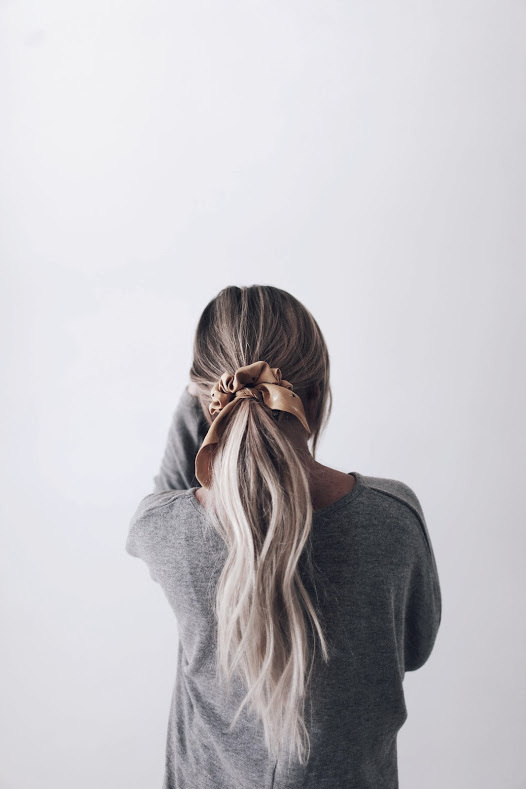 You can secure the messy bun with a hair tie first just to make sure nothing will fall out, and then add your scrunchie after! For this style I used a scrunchie with ribbon ties as I felt the ribbons would be a cute detail to add to the style! All of the scrunchies in this post are from Loop Scrunchies!! They are local to Fredericton and I swear by them, obviously lol. Let me know if any of you try any of these styles!! Tag me in your stories or posts, I wanna see!! !